Investors and analysts alike look to economic conditions and trends for clues to the direction of prices for stocks, commodities, and other investments. Often enough, however, what we think we can learn from the economy and what it actually tells us are two different things. Consider these widely accepted “truths” that turn out, on closer inspection, to be false. High unemployment is a drag on the economy and the stock market. For people who can’t find a job, high unemployment rates are a source of pain and anguish. However, for investors the jobless rate is one of the most misleading economic factors. That’s because unemployment is a lagging indicator when it comes to economic recovery. After the recessions of 1990-1991 and 2001-2002, unemployment remained high for 15 months and 19 months, respectively, after the economy got back on track. That means if you wait to jump back into the stock market until jobs come back, you can miss out on rising returns by two years and more. Manufacturing jobs pay more than service or public sector jobs. When jobs start to come back after recessionary periods, critics often say too many are low-paying “service industry” jobs. They lament the long-term erosion of manufacturing jobs, which supposedly offer higher wages. We spent all our money in the run-up to the global economic crash, failed to save for a rainy day, and now are out of work or working fewer hours. That may be the common perception, but data from the U.S. Bureau of Economic Analysis shows that Americans’ disposable personal income and personal spending are near record levels, while savings have rebounded. In fact, consumer liquidity (cash, checking, savings, and retail money market funds) is near a record, totaling 75% of annual personal income. Core inflation isn’t an accurate measure because it leaves out food and energy prices. The government says inflation remains low, yet we all see our grocery and gasoline bills rising. Because the government’s “core inflation” measure leaves aside food and energy prices (because they are volatile), critics consider the core inflation rate a bogus indicator. But food and energy together make up just 13% of total personal expenditures, trailing housing/utilities and health care, and so not counting those outlays may still result in a relatively accurate assessment of where consumer prices are headed. Also, housing/utilities and health care costs have increased far more than food and energy costs since 1980. 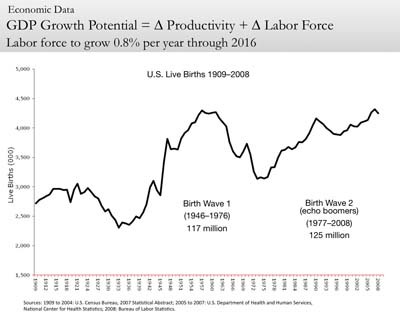 Productivity is on a long downward slide because of the aging of the U.S. work force. The oldest baby boomers hit retirement age in 2011, and millions of workers will leave the work force during the coming years. But there is an even larger group right behind the boomers that will more than replace them. People born between 1977 and 2008, known as “echo boomers,” account for 125 million Americans and outnumber the 117 million baby boomers. As a result, the U.S. Bureau of Labor Statistics estimates the nation’s gross domestic product should grow 2.5% to 3% a year during the next 30 years. GDP drives corporate earnings, which in turn drive the stock market. Demographic trends also favor the U.S. on the global stage. The only country expected to see higher growth rates in the population aged 15 to 64 between now and 2050 is India, according to United Nations projections. Social Security will bankrupt the nation as the baby boomers age. The specter of bankruptcy hovering over the nation’s Social Security system is exaggerated, according to Congressional Budget Office projections. The CBO forecasts that Social Security spending will actually decrease as a percentage of GDP during the next seven decades, because the “echo boomers” will be paying into the system. The real threats lie in rising costs for Medicare and Medicaid and a coming explosion in the cost of paying interest on the federal deficit, according to CBO projections. So the next time you hear a piece of received wisdom concerning the economy, stop and think twice. And please call our office if you want to discuss economic trends and how they might affect your investments.